Comments: Who as a child didn't use their plastic model aircraft to stage furious dogfights? I finally had a go at the demo in early 2001. By this time the game had been out a while and there were a range of reactions in the community from "a waste of time" to "good clean fun!". You have specific mission objectives which involve... he he he ... breaking things - like mum's favourite bone china... mmm, you know I was going to recommend this for kids but on second thoughts maybe not! Anyway - you simulate breaking mum's china and pick up power-up's, or bonuses. These give you extra weapons and are necessary to complete the objectives. In this case I picked up rockets and bombs. 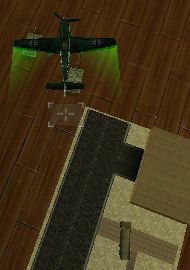 There are neat touches which made me laugh - like being able to turn the room lights on and off with a well aimed shot. Breaking mum's china vase! 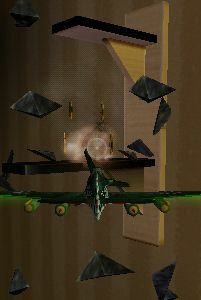 Battle in the 1st mission consisted of dropping bombs on tanks. 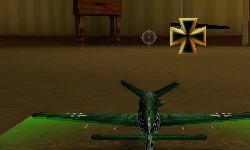 You switch to Bombsight view which is basically above the aircraft with the bombsight trailing behind and showing where the bombs will impact. This is a neat feature. Kids and folks who haven't done a lot of bombing - yes - believe it or not there are such people! - will find this intuitive and will probably start to see the relation between altitude, speed and trajectory. As a nice twist not all of the tanks are conveniently placed - some are on shelves and you have to knock them off with rockets to get a clear bombing run. Got the key - now to battle! I had no joy getting my Microsoft Sidewinder Force Feedback 2 Joystick to work - maybe this is a problem in the demo only? Nonetheless it ws easy flyable with the keyboard - meaning it's a candidate for laptop fun too. 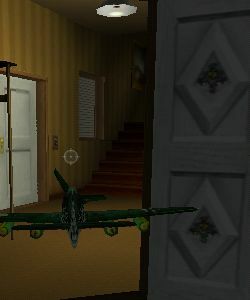 In conclusion the game seems light hearted - it's easy to play - and it might be just the thing to get a child or non-fanatic interested in the world of computer flying. Getting medals is always nice! 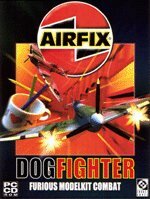 The game is strongly focused on recreating the "toyish" feel of model airplanes in "hand-held dogfights", rather than being an advanced, super-realistic flight simulator - complete with glue fingerprints on the windshield, skewed unit designations and fixed landing gears.